Is your Central Heating System displaying efficiency problems? Power flushing, by Joseph C Kenny Plumbing & Heating trained professional staff, can resolve these issues, can be performed with minimum disruption to your home and from only €400. Boiler manufacturers now insist that heating systems must be power flushed before a new boiler is installed as it may effect boiler guarantee. Would you put a new engine into an old car? - neither should you attach a new boiler to a potentially damaging heating system. It is also recommended to power flush your central heating system at least every five years even if you have not experienced any of the problems identified above. This can ensure that you maintain system efficiency and do not damage your boiler. Power flushing also referred to as 'Jet Flushing' or 'Hard Flushing' is a process by which heating systems are cleansed using water, with the addition of powerful cleansing and mobilising agents. The power flushing unit is attached to the heating circuit in place of the system pump, boiler or radiator and the flushing is done at high velocity, but low pressure, so that no physical damage is caused to the system. In this way the heating circuit can be thoroughly cleansed of lime scale and corrosion debris, which clogs up the system causing damage and inefficiencies if left in place. Power flushing can resolve and restore your heating system to new with just one call out from our trained professional staff, who will purge and flush the system with chemicals to soften and flush out the aggressive sludge that builds in your system over time. 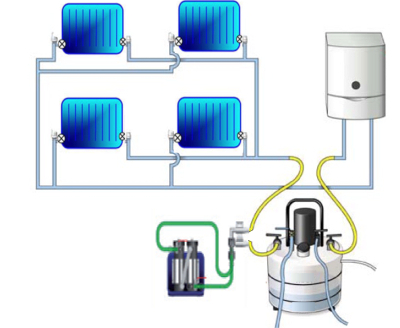 We use a purpose-designed machine with attached Magnaclean unit, to stop sludge from re-entering the system. Contact Joseph C Kenny Plumbing & Heating on 086 252 9449 to arrange your power flushing appointment today.